These codes were already implemented in an earlier version of CYPECAD and CYPE 3D. Now, in the 2015.h version, users can define the seismic spectrum. 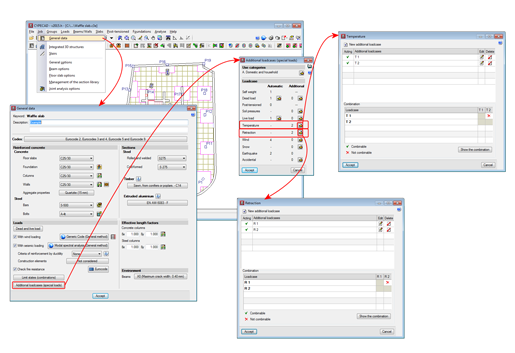 More information on which codes allow users to define a customised design spectrum can be found in the Seismic spectrum specified by users section in the CYPECAD page. 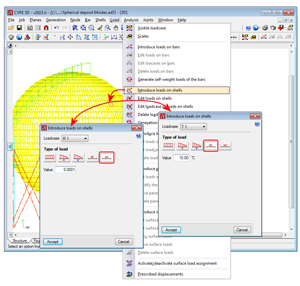 As of the 2015.h version, CYPECAD and CYPE 3D allow users to define specific loadcases for temperature and retraction loads. This way, they can be considered in the load combinations in accordance with the selected code. 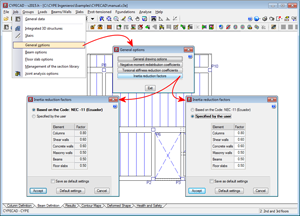 Some seismic codes specify inertia reduction factors for concrete elements for seismic loads and CYPECAD considers them when these codes are applied. 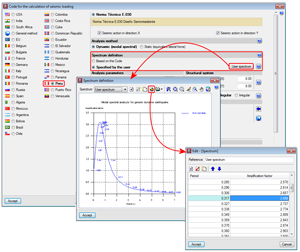 As of the 2015.h version, users can define inertia reduction factors for concrete elements for seismic loadcases regardless of the code that is used. The inertia reduction factors for concrete elements for seismic codes considered in the selected seismic code are applied. A list appears displaying the inertia reduction factors (which cannot be modified) for each concrete element (columns, shear walls, concrete walls, masonry walls, beams, floor slabs). If the selected seismic code does not define these factors, a value of 1 is displayed for all the concrete elements. Users can introduce an inertia reduction factor for each concrete element in the list (columns, shear walls, concrete walls, masonry walls, beams, floor slabs) which will be taken into account in the seismic loadcases. 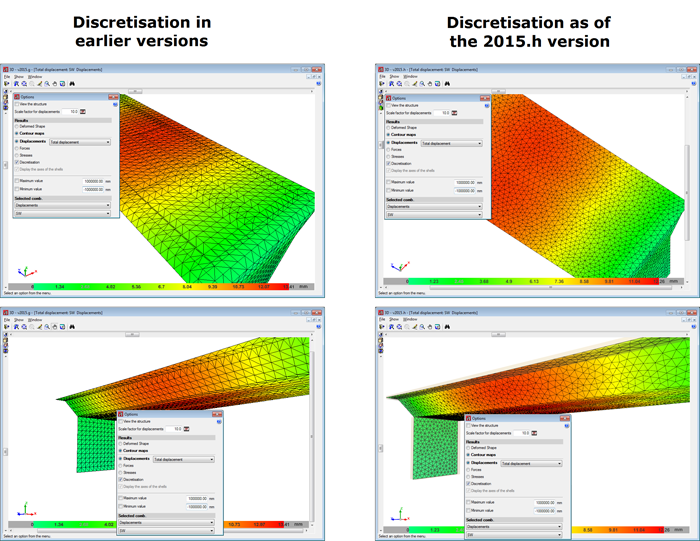 As of the 2015.h version, the mesh applied to discretise shells has been optimised. A more homogenous discretisation is now generated with an optimum ratio of each element, aimed at minimising any tension gradients between the finite elements of the discretisation. The program also adapts the mesh to the geometry of the loads that have been defined in the load panels in the same plane as the shell, and so allowing for load panels which will only affect part of the surface of a shell to be defined. Therefore, shells no longer have to be divided for a load to be able to occupy its entire surface. The load panel does, however, have to be completely covered by shells, even if there are shells in the panel that are not completely covered by it. CYPE 3D has allowed, since previous versions, for surface loads to be defined on shells. As of the 2015.h version, CYPE 3D allows users to define temperature and retraction increments on the shells. This can be done in the “Introduce loads on shells” dialogue box (Loads > Introduce loads on shells). Furthermore, now that, as of the 2015.h version, specific loadcases for temperature and retraction can be defined in CYPECAD and CYPE 3D, any temperature and retraction loads applied can be included in their specific loadcases and combined with the other loadcases in accordance with the selected design code. 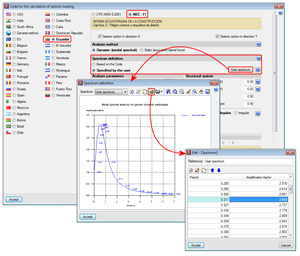 Improvements and updates have been implemented in the “Thermique” tab of CYPECAD MEP for France related with requirements of the RT 2005, RT Existant and RT 2012 codes. Deposits, wood heaters, gas/fuel heaters, heaters and thermodynamic generators were implemented in previous versions of the program for the RT 2012 code of the EDIBATEC database. Now, with the 2015.h version, the EDIBATEC database has been updated with the implementation of solar panels. Implemented in the 2015.h version is the detailed thermal bridge catalogue for timber frames for the French code: “Règles Th-U Fascicule 5: Ponts thermiques”, in the manual definition of thermal bridges. Users can import the value of the linear transmittance of the corresponding thermal bridge from those included in the code. As of the 2015.h version, the standard XML thermal properties control file for the RT Existant can be generated. This file allows for data to be exchanged between the technical programs and the administration services, developers, technical controller and certification entities. As of the 2015.h version, CYPECAD MEP designs heating installations with heating emitters in series (single-tube system) without limiting the number of emitters in the ring. This way, users will determine the viability of the single-tube heating installation based on the warnings and results provided by the program without limiting the number of emitters to a maximum number of 5 per ring as was done in previous versions. 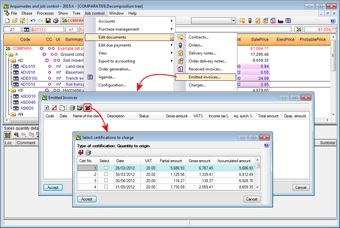 As of the 2015.h version, Arquimedes allows users to add new unforeseen suppliers to a comparative, when the comparative does not yet have all its supplies ordered. To do so click on the “Add” button (Job control > Purchase management > Purchase comparatives > select a comparative that does not have all its supplies ordered). In the Emitted invoices window (Job control > Edit documents > Emitted invoices) users can create emitted invoices by importing closed certifications. To do so, the “Emit new invoice, corresponding to the certification” button has been added, which allows users to select closed certifications (from the window that appears after the button has been clicked on) to then change them into emitted invoices. The gross amount is the sum of the certified amount plus the general expenses and the industrial benefit, both defined in the contract price structure. If the Purchase management module is used in the cost analysis preparation stage or in the cost estimate stage, the prices that are allocated in the purchase comparatives can become part of the job control reference price structure. This option is interesting given that in many occasions an estimate of the expenses is required by the Project manager (having carried out the cost analysis to provide an offer or if the cost analysis was incomplete). At this point, it is recommended the Purchase management module be used to carry out purchase comparatives, at the job execution phase, to close contracts. The prices which are allocated in the purchase process should substitute those analysed in the initial phase. These, almost definitive, prices offered by suppliers will be the ones in the contracts between them and the Project manager for the supply of the materials and services of the job. 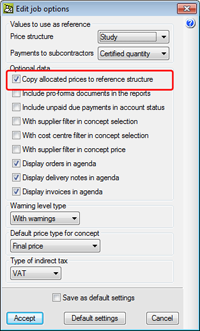 To work this way, activate the option: “Copy allocated prices to the reference structure” (Job control > Configuration). The same option can be activated in the “Purchase comparatives” dialogue box (Job control > Purchase management > Purchase comparatives). Upon selecting this option, each time a supply price is allocated to a supplier in a purchase comparative, the price will be copied in the reference price structure of the concept representing the supply. This way, when prices are allocated in the purchase comparatives, the prices of the supplies and subcontracted material which should, initially, be definitive with only the contracts left to be completed, are obtained. Therefore, the prices analysed initially are substituted by the allocated prices in the purchase comparatives in the job control reference price structure (in other words in the cost analysis and estimate stages). This way the most probable unit and/or decomposed price is obtained (ProbablePrice column) and is closer to the real price. The unit execution price (ExecPrice column) will display the probable price whilst no expenses have been incurred due to charges applied to the cost centre of the job item. In this latter case, the unit execution price will be the same as the price of the unit concept in the charge. Estimated cost based on the probable price of its unit prices. The sum of the most probable prices of all its job items. The mean weighted price of all the contracted supplies of this concept in the cost centre if it has been ordered, or the estimated price (price in the job control reference structure). The materials pending receipt and stock can be seen in the job control stage using the new option: Pending receipt materials and stock (Job control > View). Once contracts have been created using the Generate contracts option (Job control > Purchase management) or after creating general orders using contracts from the Orders option (Job control > Edit documents), the new window: Pending receipt materials and stock, displays a list of the material unit type concepts or unjustified job items with the ordered or requested quantities (depending on each case), the quantities in the delivery and the quantities pending receipt. Furthermore, if the concepts that have been received have been charged to their respective cost centres, the charged amount and quantities in stock can be seen. If a delivery note is created or if a concept is directly charged without being in the reference price structure, it will not appear in the concept list. For these unforeseen concepts to appear in the list, they must appear in the estimate or have been ordered previously.